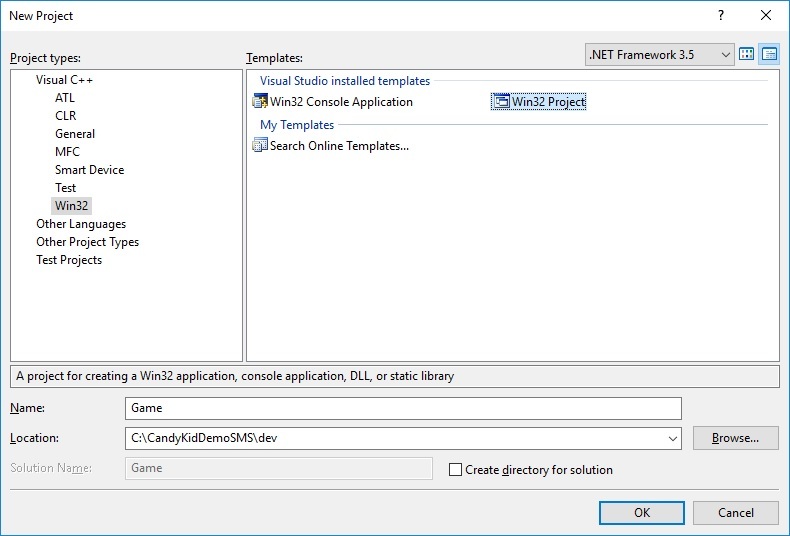 In the previous post, we checked out devkitSMS Programming Setup. 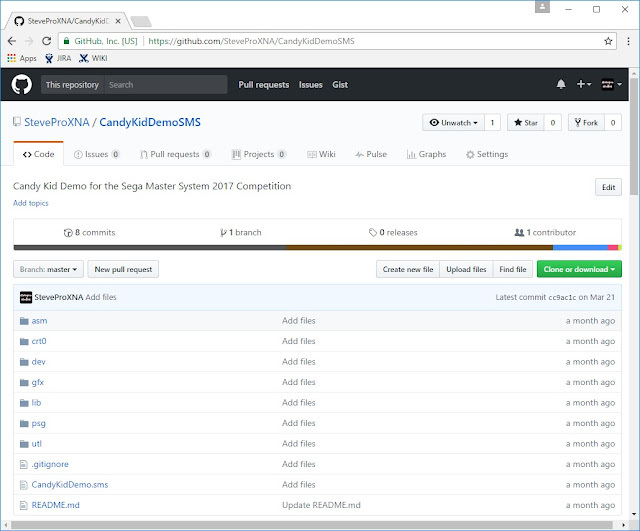 The devkitSMS provides tools and code to support homebrew development for the Sega Master System, SG-1000, and Sega Game Gear. 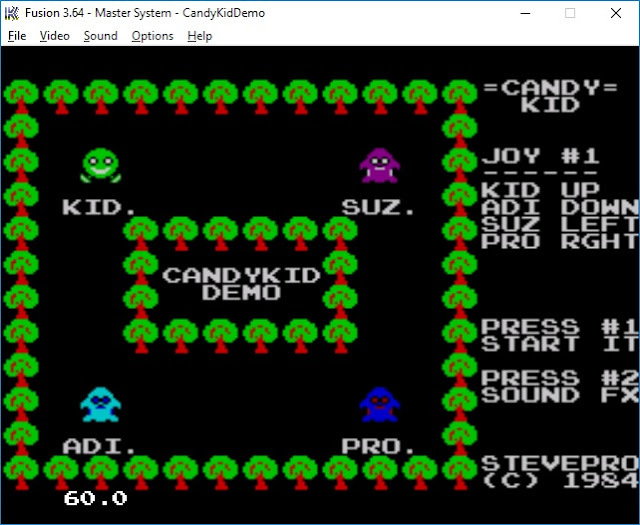 Using devkitSMS, it is possible to write game code using the C language rather than pure Z80 assembly. Therefore, we would now like to extend this knowledge and write more detailed programming sample. Follow all instructions from the previous post: this documents how to setup the pre-requisite software. Note: ensure you have downloaded and installed the devkitSMS and Small Device C Compiler [SDCC]. Also download vgm2psg.exe required to convert VGM files to the Programmable Sound Generator [PSG]. The devkitSMS programming sample is based on the Candy Kid Demo coding competition entry for 2017. All graphics, sprites, music, sound fx, coding logic etc. 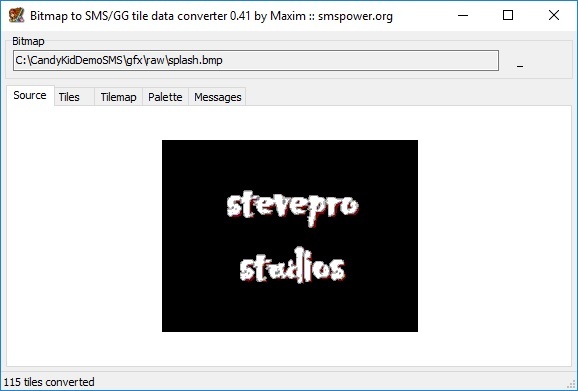 here is based on the devkitSMS tutorial by @sverx. 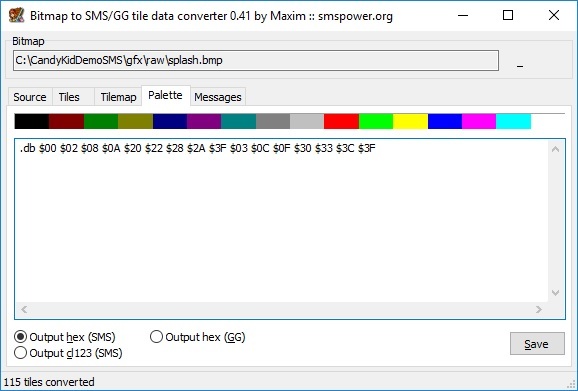 Follow all instructions from the previous post to download and install BMP2Tile utility to convert graphics into Sega Master System format. 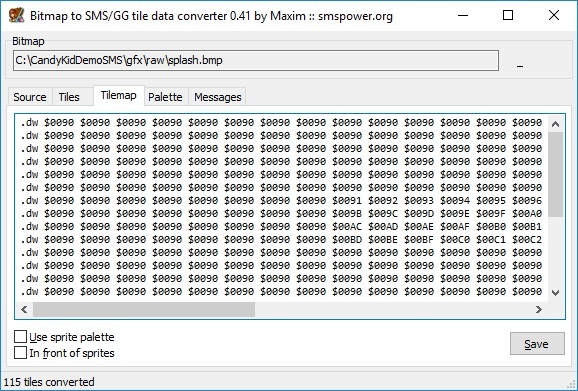 Download gfxcomp_stm.dll STM compressed format to output directory. Choose "Tiles" tab. 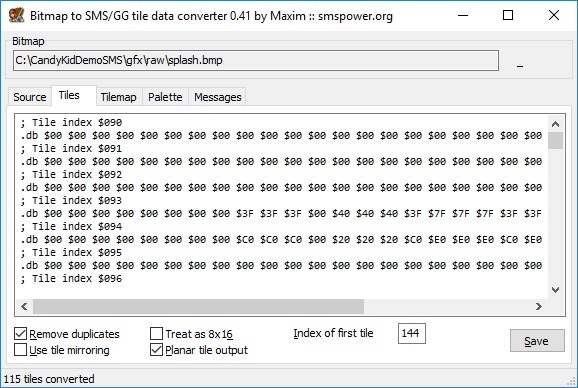 Ensure that "Remove duplicates" and "Planar tile output" are both checked. 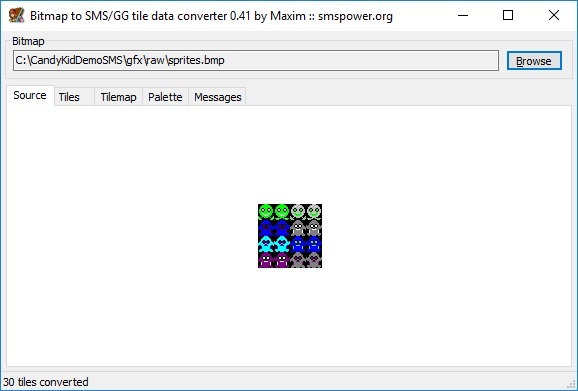 Choose "Tilemap" tab. Leave "Use sprite palette" and "In front of sprites" options both unchecked. Choose "Palette" tab. 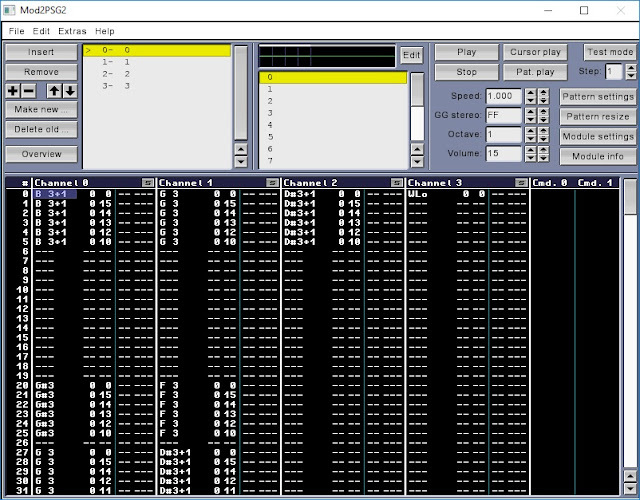 Leave the "Output hex (SMS)" option checked for Sega Master System. Repeat the process for background tiles e.g. 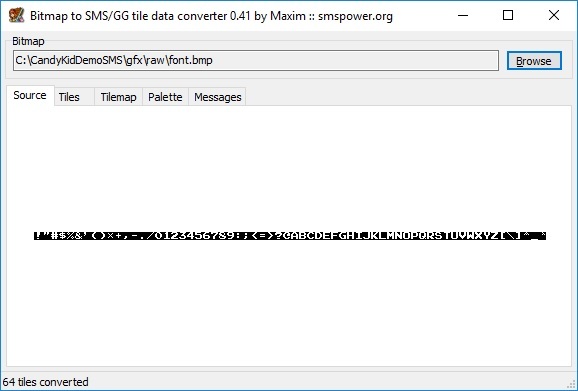 Font however save tilemap as uncompressed binary format [bin] to access data randomly. Save tiles in PS Gaiden compressed format + use same palette as above. #define TEXT_ROOT  33  // 33 is "!" in ASCII. // Must be static to persist values! Many homebrew games do not query pause button although I believe this is good programming practice! Ultimately the goal would be to write game code in Z80 assembly! However, one useful way to slowly transition from C language to Z80 assembly would be to wrap inline assembly blocks via C functions. 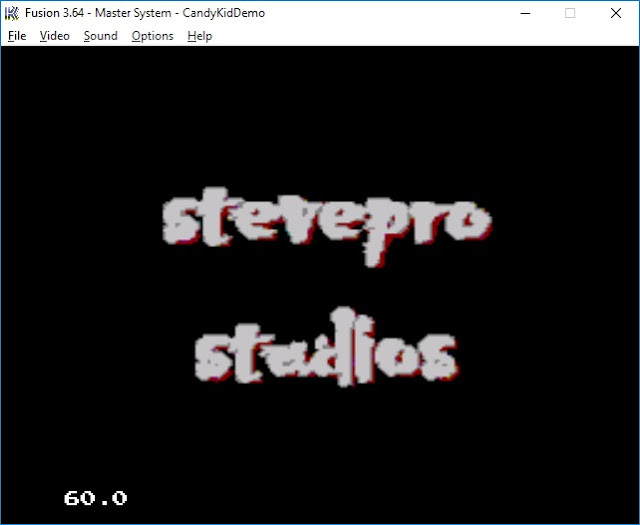 Armed with all this knowledge, we are now in an excellent position to build complete video games for the Sega Master System that will be able to run on real hardware but now without any VDP graphics glitches!